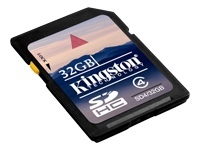 Kingston Technology's Secure Digital High-Capacity (SDHC) memory cards are fully compliant with the Secure Digital Association 2.00 specification. They are a performance class of SD memory cards designed to meet the storage demands of high-quality digital still and video cameras and other high-resolution image recording devices. SDHC cards offer larger-volume data storage and optimized recording performance with support for FAT 32 file formats. In addition, Kingston's SDHC cards use speed "class" rating known as Class 4 that deliver a minimum data transfer rate for optimum performance with SDHC devices. For added reliability and durability, the solid-state SDHC memory cards are built of nonvolatile memory components and have no moving parts that could wear out or break.